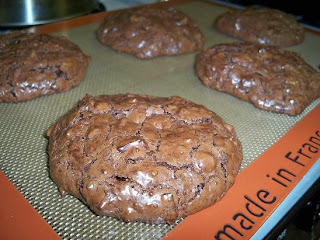 If you're looking to create a rich, decadent treat that will impress your friends and family, this is your recipe--flourless double-chocolate pecan cookies. I was immediately drawn to it when I saw the words "flourless" and "double-chocolate." Those of you who've been reading my blog for a while know that I'm a total dessert-aholic and my love for sweets lies mostly in chocolate. I made these cookies just last week and brought them to my cousin Tibor and Stephanie's place. The response was great and they were even better after being warmed up for a few seconds in the microwave--so soft, gooey and chocolatey. We paired them with a mix of hazelnut, tiramisu, pistachio and stracciatella gelato from Terrizzi Pasticceria. The cookies almost tasted like rich brownies and because their texture is super dense, we had to wash them down with some good ol' fashioned milk. The recipe is super easy and doesn't require any special ingredients. If you're thinking about omitting the nuts, please reconsider because they offer such wonderful texture. The entire cookie is a delight--I hope that you agree.